It’s here. My first Birchbox! I’ve been so eager to get it, that I have seriously checked the mailbox everyday since I made my purchase. Now, I must confess that initially… I was a bit disappointed. Maybe it’s because I’d pumped myself up for this box or maybe it was all the other bloggers like her that received uber cool boxes, but I felt like my box was a bit weak at first. But then…. I discovered just how awesome this Stainiac (lip and cheek stain) by the Balm is and I’m on cloud nine again. After receiving my box, I couldn’t wait to try out some of my new products. 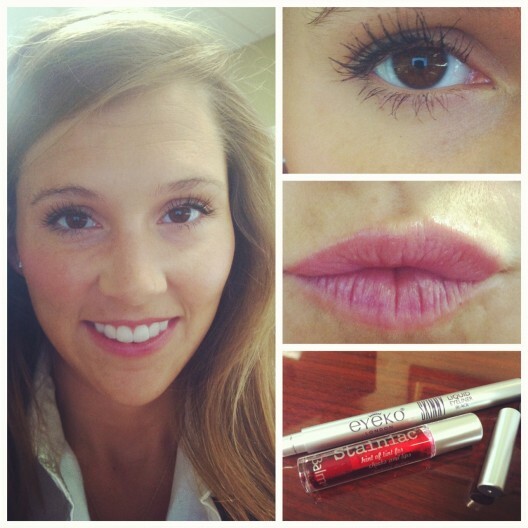 In the photo above, I’m wearing the Balm Stainiac and Eyeko‘s skinny liquid eyeliner! Both, I really love. I’m not typically an eyeliner wearer, mostly because my hand is never steady enough to apply the stuff – but, I tried it and I think it looks pretty decent. However, it’s the Stainiac that really made an impression. In my future, I foresee Stainiac in every color. These two products can be purchased here and here. Melvita Floral Water, love this – it’s a great product to refresh your look at the end of a long work day! All can be purchased at Birchbox.com. For a full list of products featured in June’s Birchbox, click here. Are you a Birchbox subscriber? If so, I’d love to hear what awesome products were your favorite for June! If not, sign up here as my referral! 20 Jun ’12 Filed under A Few of My Favorite Things, Life As I Know It. Tagged beauty, birchbox, fashion, make-up, products, style. Bookmark the permalink. Post a comment. Leave a Trackback (URL). How to… make drab work shirts look fabulous! Okay, maybe not fabulous, but definitely less drab. What color is the stainiac? The color above is Prom Queen, but I purchased Beauty Queen too and love it!